FILE - President Barack Obama, Feb. 3, 2016. U.S President Barack Obama has discussed the Syria crisis with Russian President Vladimir Putin, emphasizing the importance of Moscow playing "a constructive role by ceasing its air campaign against moderate opposition forces in Syria." The two leaders spoke by phone Saturday to "discuss the decisions and agreements made at the February 11 meeting of the International Syria Support Group (ISSG) and to stress the importance of rapidly implementing humanitarian access to besieged areas of Syria," a White House statement said Sunday. The Obama-Putin discussion came just days after U.S. Secretary of State John Kerry and Russian Russian Foreign Minister Sergei Lavrov announced a plan for a "cessation of hostilities" in Syria within a week, with a formal cease-fire to follow at a later date. 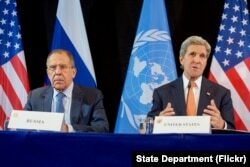 U.S. Secretary of State John Kerry, joined by Russian Foreign Minister Sergey Lavrov, addresses the media on Feb. 12, 2016, at the Hilton Hotel join Munich, Germany, following a meeting of the International Syria Support Group. Russia began carrying out airstrikes in Syria in late September, with the stated goal of diminishing Islamic State forces. But Western governments say the majority of the airstrikes are targeting moderate groups opposed to Syrian President Bashir al-Assad. Moscow has rejected the criticism. FILE - This photo made from the footage from the Russian Defense Ministry official website on Feb. 1, 2016, shows what it says is a column of heavy trucks carrying ammunition hit by a Russian air strike near Aleppo, Syria. As the Obama-Putin talks unfolded Saturday, Russian Prime Minister Dmitri Medvedev said the Syrian conflict has triggered what he called "a new Cold War." Speaking at the Munich conference, Medvedev linked heightened East-West tensions to NATO expansion and "regime change projects." On Sunday in Munich, U.S. Senator John McCain, a staunch critic of Russia's role in Syria, said Putin is "not interested" in being a partner to international efforts to end the multi-factioned war in Syria. Speaking at the close of the ISSG conference, McCain accused Putin of using airstrikes in Syria "as a live-fire exercise" aimed at evaluating and upgrading Russian military technology. He also accused the Russian leader of trying to turn Syria's Latkia province into a "military outpost from which to harden and enforce a Russian sphere of influence." I want to be wrong," McCain said, while voicing fears that "the war in Syria will, in his words, "grind on, more innocent people will die, Western credibility and influence will diminish, the refugees will continue to flow out, [and] the terrorists will continue to flow in."